Imagine relaxing on your large sun deck with picnic table, lawn chairs and charcoal grill after an incredible day of lake activity. Paddling, pontooning, swimming, fishing on Garden Lake (one of four lakes on the White Iron Chain of Lakes). Log Cabin 8 has carpeting and an open floor plan and lots of cupboard space. Making meals in the full kitchen is easy! All cookware, bakeware, utensils, coffee maker and microwave are supplied. Go canoeing, kayaking, and take the paddle boats for shoreline jaunt. Sleeping arrangement: Queen bed in the downstairs bedroom. Full bed in the loft bedroom. Full bathroom is downstairs. Deer Ridge Resort has 9 cabin rentals on Garden Lake. 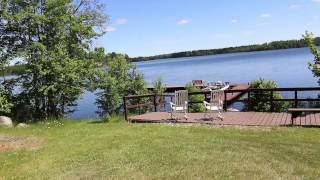 All have wireless Internet; all have access to the fish cleaning facility, Sauna, ice, gas, 35 acres of pristine woodlands and over 2,500 feet of shoreline! Canoes and kayaks are free for guests, so paddle for days and listen for the haunting cry of our state bird – the loon! Better yet, rent one of our pontoon boats and explore miles of shorelines and islands. There’s no better place in the world to fish for smallmouth bass and crappie! With over 6,000 acres of lakes you might think finding fish is hard. However, since you plan and book with us here at Deer Ridge Resort, we can mark up a fishing map to tip the scale in your favor. We’ll let you know where the best structure is for trophy northern pike and walleye in the 5-8 lb range. For a true wilderness lake then make a wake to South Farm Lake - set inside of the Boundary Waters Canoe Area. Nature photography and bird watching can’t get any better! If you can find time to play outside of the resort and away from the White Iron Chain of Lakes, we recommend the following activities. The Wolf Center, Bear Center, Dorothy Molter Museum, nearby golf, BWCA, Quetico Provincial Park, and Lake Superior. This is your chance to discover wilderness lakes and forests unchanged by the hand of man, and a little northwoods culture. Our northeastern Minnesota wonderland is waiting for you. Ely, MN is stacked with fun things to do for the whole family, and the wide variety of stores make even a rainy day FUN. Stop at one of the fine dining establishments or friendly bars and see for yourself why Ely has the best reputation for friendliness.